1) Auto loading & lift platform: wood sheet is placed on lift platform first, then platform rises to proper height and router gantry moves towards to the wood sheet; the wood sheet is sucked by the sucker that mounted on the gantry after the gantry reach to sheet; wood sheet is pulled to the router table by the sucker with the gantry moving oppositely. The loading process is fully automated, this design improves efficiency and saves labor meantime. This cnc wood router machine is good for bulk production of cabinets. 2) Material auto location: the sheet is located automatically by pneumatic material alignment Pop-ups after it reach to the router table. High efficiency, good positioning accuracy and save labor. 3) Auto unloading: after the machining process finished, the material push device will push the wood pieces away from the table and to the conveyer belt platform for collection. 4) Italian drill head: there are lots of drilling and cutting jobs in kitchen cabinets production, so the cnc wood router is equipped with original Italian FAM drill unit and the drill construction is 9 vertical + 2 horizontal + 2 saw. This drill package improves drilling and cutting efficiency greatly. 5) Auto tool changer: cabinet projects need multiple tools machining; design of pneumatic spindle shift auto tool changer is the best choice for considering from both performance and cost. As all woodworkers know, benefit of auto tool changer is that it optimizes the tool changing process and save time for us compared with a machine without ATC option. 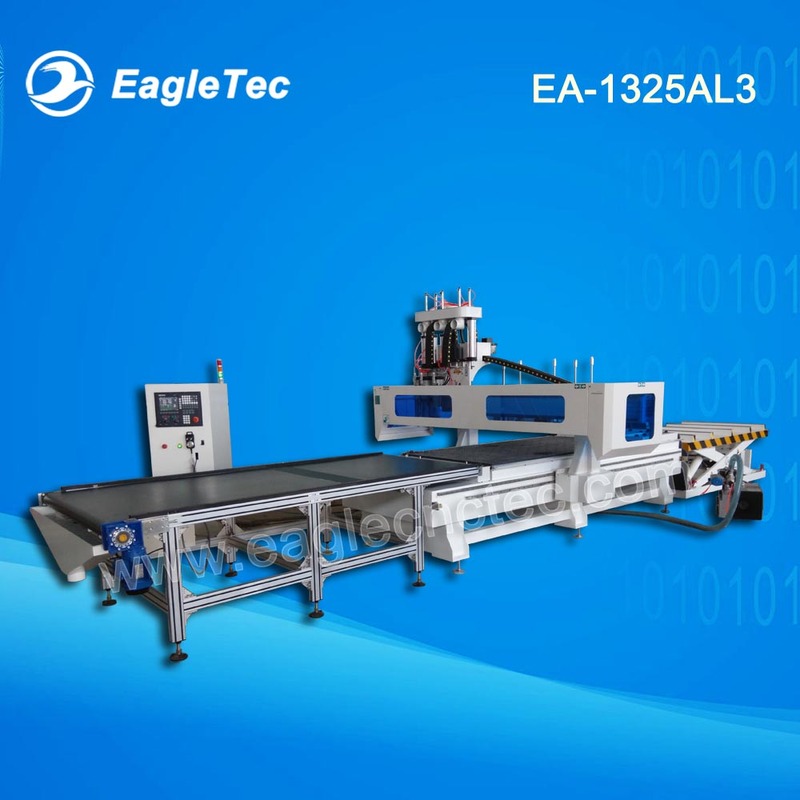 From all five points above, we can see that the cnc wood router EA-1325AL3 is designed based on the custom cabinets production characters in purpose of high production output, high machining accuracy and labor cost saving. a. It will reduce time cost greatly for us on design and toolpath programming. b. By optimizing the typeset, it improves the material utilization to max extent. This will save production cost for us. Most important, it is environmentally friendly. To learn more about this cnc wood router, please click icon “Inquire Now” near the top of this page.